When you are cooking for company and easy is the name of the game, this recipe kicks it. Some of my family came into town for a few days and I wanted something easy for Thanksgiving breakfast. Easy was NEEDED because right after breakfast, the dessert making commenced for the large Thanksgiving dinner that we were going to and it was imperative that breakfast be done and gone and the kitchen became prime real estate. The ease and adaptability of this recipe to your families tastes is perfect. If I would have had the time, I may have set up an assembly line of ingredients where people could make their own, with options like: onion, peppers, mushrooms, cooked bacon or sausage, artichokes, etc...this list could go on. I don't have pics of the finished plate because they got gobbled up quite quickly, but they were served with toasted bagels or English Muffins and some ate as a breakfast sandwich, where has others had the bagel on the side and the egg with a little more cheese on top. Really dig the simplicity of this and how cool they looked puffing up like mini souffles in the oven while baking. Preheat oven to 350 degrees. Butter the muffin pans to prep for egg mixture. Crack all eggs in a large bowl. Add cheese, milk and spices and whisk until eggs are combined. Pour into cupcake tin until the egg mix is about 1/2 - 3/4 up the side of each mold. They will expand and puff up while cooking. 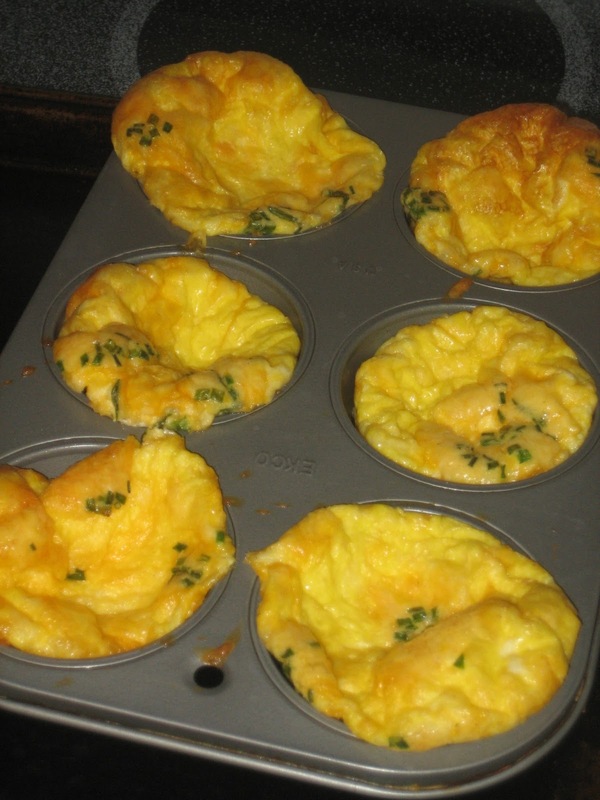 Bake for 18-23 minutes until eggs are cooked through. Sprinkle some more cheese on top about 3 minutes before done if you want extra cheesy baked eggs. Serve with and English Muffin or Bagel as a sandwich or plain with a side of toast.